I am writing to you from an airplane slicing through swirls of creamy clouds as light as my Mom’s mashed potatoes. I love to look out airplane windows and contemplate life. There is just something about getting above the planet and looking down on the patchwork of crop fields dotted with meandering streams that gets me out of my myopic view of everyday life. I feel like pressing my nose against this window on the world for the entire flight. Imagine the colossal view that God has not just of Earth and all the celestial wonders, but also a close-up watch on each of our lives. The ancient Jews called Him El Roi, which means “the God who sees.” He sees all the moments of our existence from our beginnings in the womb to the end of our days and every nanosecond in between. God sees the wrap up of our 2015 and sees ahead to the adventures and challenges of 2016. He observes what we eat, how we drive, how we work, how we interact with others. El Roi never loses sight of who we are and what we need. But you know what? At times I pause and wonder if God has diminishing vision. Hearing about unspeakable ISIS atrocities, or violence in America, or people suffering everything from cancer to loss of jobs ruffles my faith in God’s eyesight. Is God seeing this breakdown in our world? Is He simply catching a quick glimpse of our angst or is He truly focused on us when disappointment and despair invade? I’m never out of your sight. . . . Is there anyplace I can go to avoid your Spirit? To be out of your sight? If I climb to the sky, you’re there! you’d find me in a minute—you’re already there waiting! (Psalm 139: 3-10, The Message). God not only sees us now, but He’s already ahead waiting for us? That’s a mind stretcher, but it settles my doubts about El Roi’s need for His annual eye exam. Today’s flying “on morning wings” reminds me that no matter where we travel or if we hit some turbulence along the way, we will never escape God’s notice. 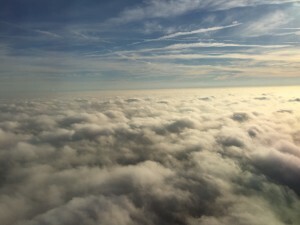 Before my plane descends, I want to linger above Cloud 9 just a little longer, pondering El Roi’s perfect vision and my need for His observant care in the year ahead. If you’d like to join me, I’ll switch to the middle seat so you can get your own close-up view of the creamy clouds as light as my Mom’s mashed potatoes. How would you describe God’s eyesight? Brave and Resilient Tip #129: No matter where you are, you are never out of God’s sight.